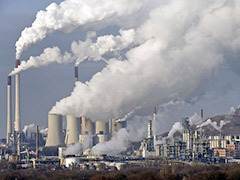 Scientists at the University of Toronto have discovered the existence of a dangerous chemical in the atmosphere. Where most greenhouse gases absorb only certain types of heat or infrared radiation, this chemical, perfluorotributylamine (PFTBA), absorbs every type. The absorption and entrapment of heat and radiation is what causes global warming. According to an article by Emily Chung of CBC News in Canada, scientists found small concentrations of PFTBA in Toronto’s atmosphere. Though these concentrations didn’t match those of other greenhouse gases, like carbon dioxide, PFTBA will most likely have long-lasting effects. PFTBA has the highest radiative efficiency of any chemical found to date. Radiative efficiency is a measure of how effective a chemical is at warming the climate. “Calculated over a 100-year time frame, a single molecule of PFTBA has the equivalent climate impact as 7,100 molecules of CO2,” said researcher PFTBA does not occur naturally. We began introducing it in the mid-20th century for various electrical equipment uses, like electronic testing. One of the problems at hand is that it may take hundreds of years for the PFTBA to be destroyed. The Environmental News Service reports that PFTBA can only be destroyed in the upper atmosphere, and that there is no known way to destroy or remove it from the lower atmosphere. The chemical has long been known to have the potential to cause damage to the ozone layer. But up until now its ability to trap heat in the atmosphere had not been measured, nor had it been detected in the atmosphere. On the surface, this greenhouse gas discovery seems like scary, apocalyptic stuff. But, since PFTBA’s identification, many have scoffed at the miniscule levels and their corresponding inability to do serious damage to our atmosphere. Here’s hoping they’re right. We’ll have to do our best to keep up with any ongoing developments. Posted on December 27th under Global Warming Issues.